Search.futuremediatabsearch.com is a search engine having all the features of a browser hijacker, so if you ever discover it on your web browsers, the first thing you should do is go to implement the Search.futuremediatabsearch.com removal. Keeping it in the place of your default search tool and using it every day for performing web searches might result in disastrous outcomes, so the sooner you delete Search.futuremediatabsearch.com from browsers, the better. Do the same with all the search tools that are set on your web browsers without your permission – despite the fact that they usually look like legitimate search providers, they are tools used by certain companies to get money from advertising. That is, such tools which are illegally set on users’ browsers have definitely not been released to help users conduct more effective web searches. Search.futuremediatabsearch.com is a browser hijacker infection, so it will not miss an opportunity to change your browsers’ settings if it ever enters your computer. It is usually set as a homepage and search tool on browsers, but you might also discover it set as your New Tab page. This website will help you to access several popular pages because it contains quick-access buttons on its starting page. Also, it will bring search results to you when you enter something in its search box. Sadly, this still does not make it a trustworthy search provider. It differs from legitimate search tools in a sense that its search results contains advertisements. In other words, you will see ads looking like ordinary search results, and their biggest drawback is that they can redirect to untrustworthy pages with malware. You will be sure that they are no longer displayed to you only if you uninstall Search.futuremediatabsearch.com from your browsers – we recommend getting rid of it today. 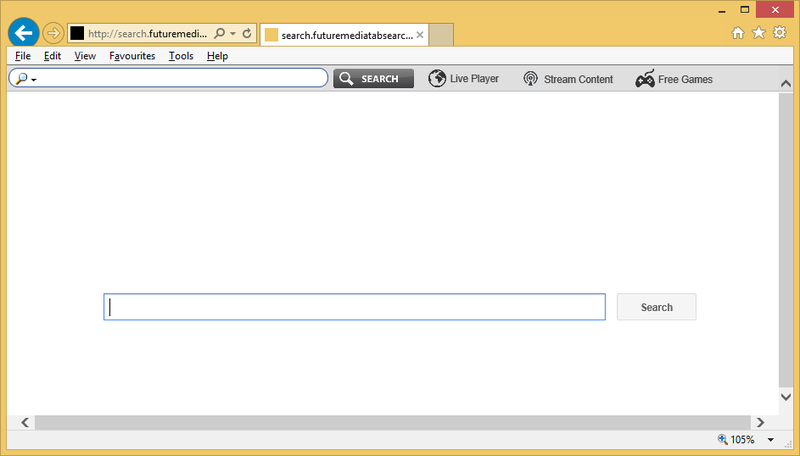 How did Search.futuremediatabsearch.com enter my PC? The browser hijacker Search.futuremediatabsearch.com has, most probably, entered your system and applied changes to all your browsers because you have downloaded and installed a bundle containing software from a page promoting free software. Also, this could have happened if you clicked on a malicious link or a commercial advertisement. Last but not least, you could have set it yourself on browsers thinking that it is a legitimate search provider. As can be seen, there might be several reasons why you have found this search tool on your browsers, but there is only one thing you must do – remove Search.futuremediatabsearch.com from your web browsers as soon as possible. How do I delete Search.futuremediatabsearch.com? You can remove Search.futuremediatabsearch.com from your browsers by setting a new reputable search provider in this place. We call this the manual removal method. Of course, there is one more thing you can do to implement the Search.futuremediatabsearch.com removal – you can delete Search.futuremediatabsearch.com automatically by scanning your computer once with a reputable scanner. This scanner will quickly undo the changes made by the browser hijacker. Also, you will get other infections erased from your PC. Therefore, we would choose this method over the manual one.